Winter can be hard on your car - both inside and out. Salt build up on your mats and carpets, dirt and grime from those wet, muddy end-of-winter months, and general messiness that comes with the winter. 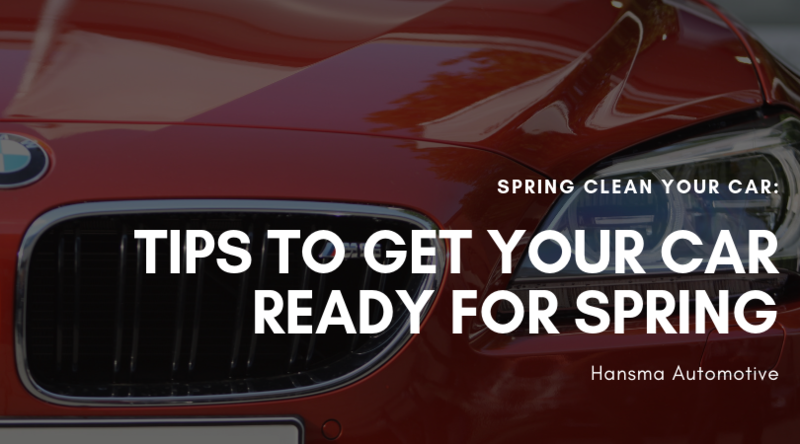 Learn how to spring clean your car with these great tips, resources, and videos - including how to remove salt stains, how to deep clean your car, and even how to organize your vehicle. See how below! Spring cleaning your car will help ensure that all the salt, dirt, and grime buildup from the winter doesn’t last into the warm months! Check out these great tips below to learn how you can get your car ready for the spring and summer. Although road salt helps keep us all safer from slips and falls, it can do a number on your vehicle - including the inside. After a long winter, you’ll likely notice a large amount of white, thick crystal-like residue on your carpets. Check out this great video from Ammo NYC that shows you how to quickly and safely remove salt stains from your carpets. You can remove salt stains from your carpet in just a few minutes! First, take your mats out of your vehicle and vacuum as much of the salt and dirt out of your carpet as possible. Then, mix your water and vinegar together a in spray bottle to create a 50/50 solution. Spray the solution onto your mat and let it stand for a few minutes. After it’s soaked in, take your thick brush and start to gently scrub the salt and dirt. You don’t want to push too hard or you risk pushing the dirt and salt deeper into your mat. After that, spray your mat again, soak it, and then use your rags to soak up the water, salt, and grime. If you have a wet/dry shop vac, use that again to soak up the remaining build up. Do NOT use a regular vacuum - the salty water can cause damage, which may result in expensive repairs! If you don’t have a wet/dry shop vac, you can use more rags and even paper towels to help soak up the rest of the moisture. Let the mats dry overnight - outside of your vehicle. This will not only help the moisture evaporate, but it will help ensure your car doesn’t smell like vinegar for weeks to come! Unfortunately, dirt and debris don’t just gently fall onto the floor. It gets everywhere! Take a look at the sides of your doors, your steering wheel, and your dashboard. Even if you are careful all winter long, the dirt from your winter boots and other winter clothes will likely end up in places you never imagined! Not only that, but spilled drinks, dropped food, and other dirt can build up if you tend to eat in your car. Remember, before you wipe down your vehicle, it’s a good idea to de-clutter first. If you have bags and garbage laying around on the floor, it’ll be hard to access every inch of your car. So, before you get to it, bring out a big garbage bag with you (depending on how much garbage you’ve accumulated over the winter months) and make sure you de-clutter before you get to the deep clean. Check out the great video below from Clean My Space to learn more about the basics of thoroughly cleaning your vehicle. A thorough car cleaning can take some time - but it’s worth it! You’ll want to ensure you thoroughly clean every part of your car to make sure it’s well maintained over the next few seasons. If you’re looking for more guides on interior car cleaning, check out the tips from AMA Insider or Family Handyman. It can be hard to wash your car in the winter. In Southern Ontario, it’s not doable by hand during the cold months, and it’s often difficult to clean through a car wash when the temperates are low as the water instantly freezes as soon as you leave the wash! Because of that, many Canadians don’t get the chance to clean the exterior of their car as often as they would like to during the winter. Check out the video below from Ammo NYC that shows you how to wash your car after the winter! If you want to skip ahead to watch only exterior cleaning, start the video from 2:40. Wheels.ca suggests you use the “two bucket method” when cleaning the outside of your car. Instead of using one bucket for your soap, water, and rinsing out your mitt, use two buckets. One bucket is for your soap and water, and the other is for rinsing your mitt! That way, your soap/water bucket used for cleaning your car stays nice and clean! To wash your vehicle, you should rinse off your car first. Then, use your car wash mitts and soak them in the soapy water. Use your mitts to thoroughly clean the exterior of your car - don’t forget the windows and the tires! Thoroughly rinse off the soap, and then dry with your drying clothes. If you don’t have materials designed for use on a car, it’s a good idea to pass by the store ahead of time to pick up soap, towels, and other materials (such as sponges) specifically designed for use on cars. Regular towels may not work well for your car, and dish soap can actually cause damage to your car’s paint. P.S. Remember to remove your winter tires in the spring! Spring cleaning is only part of properly maintaining your car. You’ll always want to ensure that your vehicle is regularly maintained and serviced - and one of the best times to do that is after the harsh winter months. 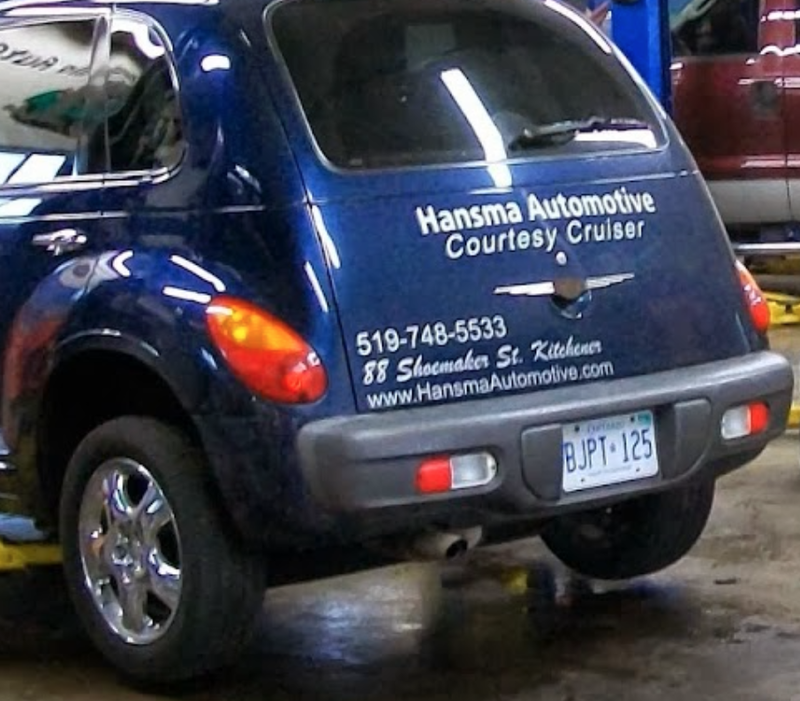 If you live in the Kitchener-Waterloo area, you can trust Hansma Automotive to help you with any repairs and maintenance you may need on your vehicle. Contact us today! Need Spring Maintenance On Your Car? Posted on March 28, 2019 by Hansma Marketing.